Spring has certainly sprung, what a glorious few weeks we have had of late. Everything is bursting open and rushing into flower. I love the excitement of this time of year, it’s so lovely to walk around the garden and see what’s newly out every few days. It really makes all the hard graft worth it. My favourite place at the moment is the shade structure with all of its interesting woodland perennials. This is the best time for woodlanders, they are at their height of interest as they make the most of the early spring sunshine before the canopy of leaves overhead develops and blocks out the light. 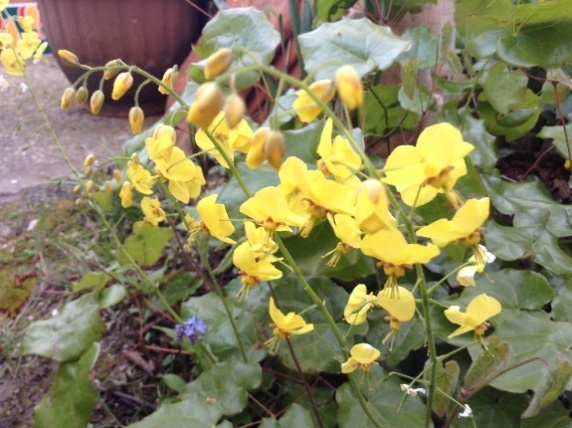 One of my favourite groups of plants are the Epimediums. These form dense clumps of evergreen foliage from which thin delicate flower spikes appear in April in an array of colours. Epimediums like shady spots under trees and will tolerate some dryness as long as they have a good humus rich soil. One of the easiest to grow is Epimedium x perralchicum ‘Frohnleiten’ (pictured) which produces golden yellow flowers and makes dense clumps. Epimedium x rubrum is a more delicate form and produces rosy red flowers but still makes good clumps in time. 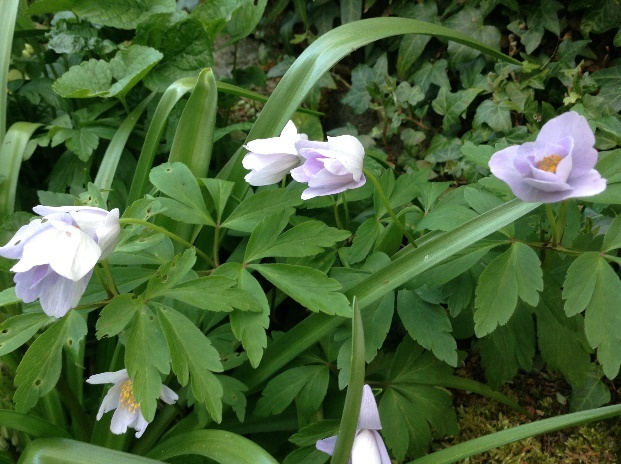 Another spring favourite are the Wood Anemones. All of the Anemones, nemorosa forms do well in dappled shade with a good humus rich soil that has some moisture. Of these my favourites are Anemone nemorosa ‘Robinsoniana’ (pictured) with its silvery-lilac single flowers. While Anemone nemorosa ‘Alba Plena’ has lovely double white flowers. If you don’t have a woodland setting in your garden then you can grow these beauties in a north facing site which stays cool all day. Polygonatum x hybridum or ‘Solomon’s Seal’ (pictured) is an old favourite for the shady area producing long arching sprays of foliage. 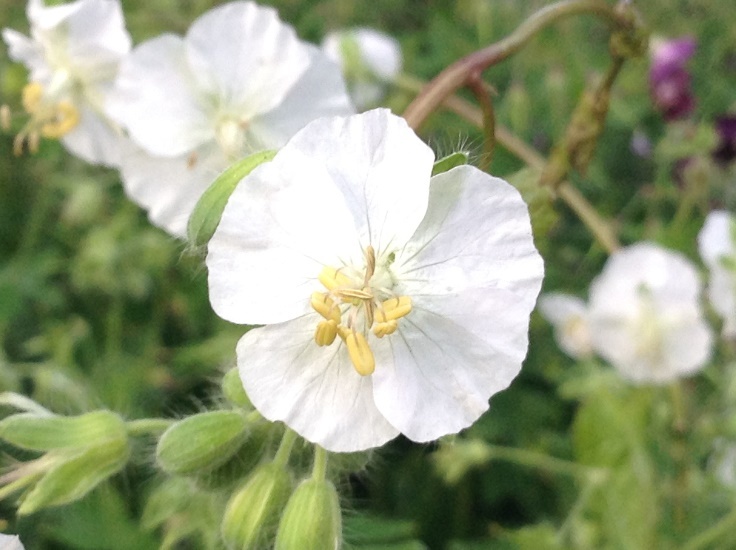 Delicate tubular white/cream flowers appear in April. These flowers are often edged with green. Like a lot of woodland plants these do prefer a good humus rich soil which can retain some moisture and, with time, these can form quite dense clumps. 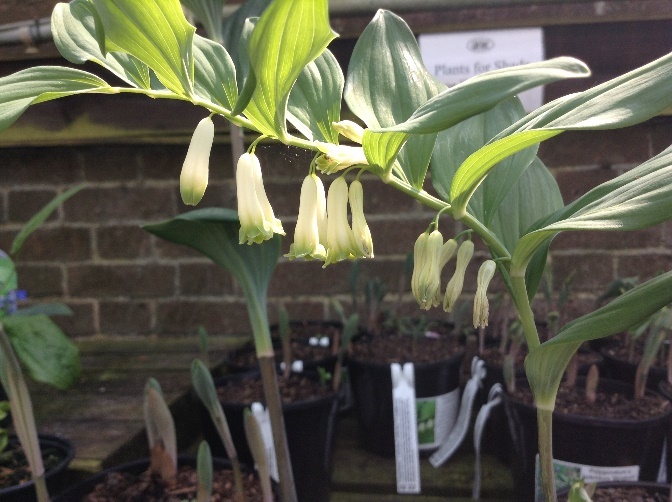 The highly variegated form known as Polygonatum x hybridum striatum make a striking plant when the foliage is fresh. Now those of you who know me know that I am a bit of a perennial geranium fanatic! Now is the time to start thinking of these wonderful plants that flower for months on end. These will tolerate a wide range of sites but this month we are looking at plants for the woodland or shady border so why not find room for one of the following. 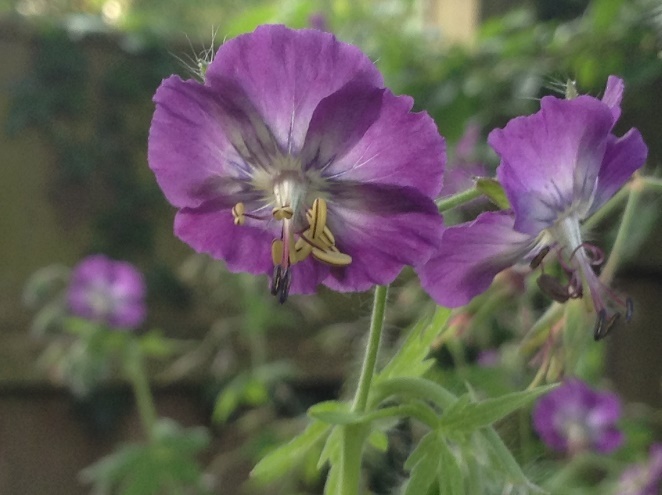 Geranium phaeum ‘Langthorn’s Blue’; (pictured) a beautiful plant that will tolerate full sun or dappled shade. It will flower for months and certainly is worth a place in the shady border. Its beautiful deep mauve/blue flowers with overlapping petals appear in April and it will keep flowering until June. Bees love it, especially the small bumble bees. It does tend to seed about which is one of the things I love about it and it cross-breeds with all other geraniums freely so the seedlings that come from it are often different colours. Geranium phaeum ‘Album’; this really shows up in the shady spots in my garden at home and becomes almost translucent towards dusk giving it a ghostly appearance. 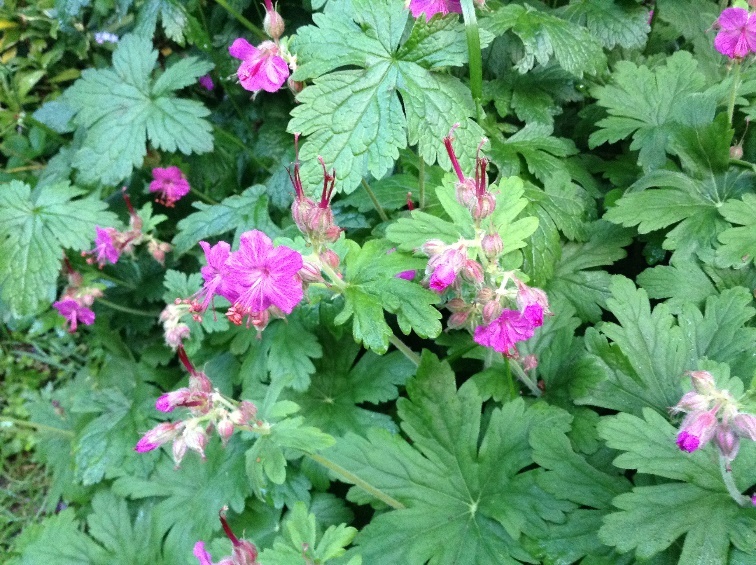 Geranium macrorrhizum ‘Bevans Variety’; a tough hardy evergreen mat-forming perennial geranium. This plant loves shade and even quite dry areas. I grow this under several trees in my garden at home and they thrive, in fact they can be a bit of a thug. There are several varieties but ‘Bevans’ is my favourite with its ‘Barbie’ pink flowers and strong scented leaves. It flowers only the once each year but makes up for it with a mass of flowers for about 6 weeks. Finally something completely different, a nettle! Yes, you heard me, but this is a beautiful one. 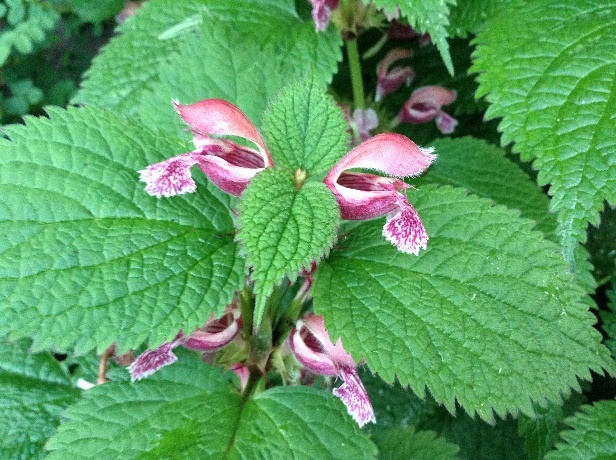 Lamium orvala is a large clump forming dead nettle that produces striking pink flowers with delicate veining. Loved by many insects but especially bees. This likes dappled shade and some humus rich fertile soil with some moisture but once acclimatised to your garden will actually tolerate quite dry conditions. It forms dense clumps and can be cut back hard after flowering to encourage a second flush of flowers. Bird Boxes – If you have not got around to putting up your bird boxes now is an ideal time to be thinking of getting it done. The birds are looking for places to raise the next generation. Make sure you site them away from where predators can reach them and out of full sun. Watering – When watering newly planted plants it is always better to water well rather than little and often. Give plants a really good soak so that the water gets to the bottom of the root system. This can be done by leaving your hose on a trickle for 5-10 minutes per plant (especially trees) so that the water percolates down into the root zone. This will then reduce the risk of the plant surface rooting and therefore drying out and maybe dying if you go away for the weekend or longer. Sunday 9th April– Garden open in aid of the National Garden Scheme 2-5pm. Thursday 13th and Friday 14th April– Easter Trail come and see what you can find in the garden! Tuesday 25th April– Where To Start Sorting Out Your Garden Talk – make sure you book your place on this informative talk by Penelope Walker.